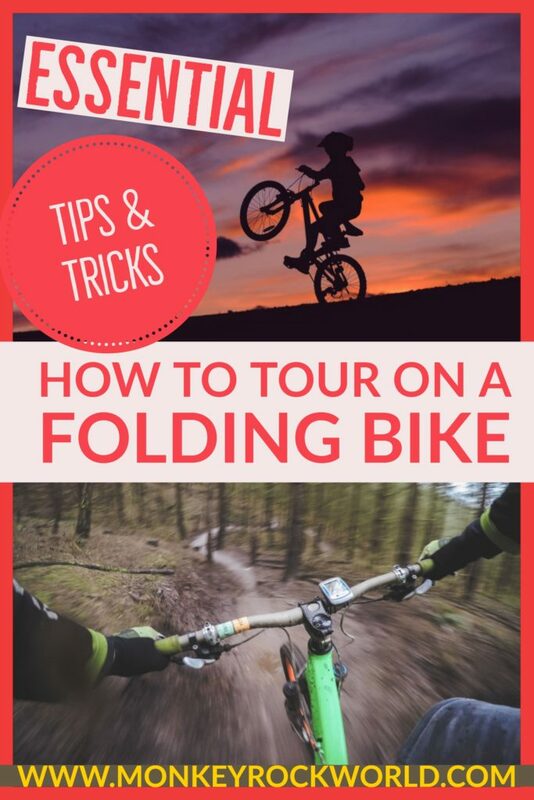 We have been toying with the idea of touring with folding bikes for a long time. Not only we have met several inspiring touring cyclists in incredible places over the years, but we also felt that after using buses, trains, planes, hiking, hitchhiking in odd places, 4-day-long boat trips on a Pelni and you name it, it was about time to try cycling as a mean for chasing some adventures. But how to actually get started doing it? And why we ended up using folding bikes? It finally happened as we journeyed to Sulawesi, home, among other great things, of Tangkoko National Park and its endemic Black Crested Macaques. There have been countless occasions we could have chosen bikes over other means of transport in our travels. But we only started in Italy prior to our marriage in the summer of 2017, riding around my hometown’s countryside with a mountain bike and a regular city bike. We managed to cover 20 to 30km daily, with minimal effort and in less than three hours. The good results on flat terrain made we feel empowered by the bicycles, which started looking like the best way forward to spice up our travels. “Oh yes, this is cool. Now we can just storm off and do it,” we thought. I knew we could do it because I’ve always kept in mind Tom Allen’s philosophy, excellently exemplified in his Three Steps to Cycling Around the World. Since we didn’t have to worry about the “quitting the job part”, the only things we had to do were getting two bicycles and go. It just turned out to be a little less straight-forward than expected, but in the end, we followed the advice. Well, I knew I wanted to go, but I didn’t know how serious Kit really was about this whole cycling ordeal. She’s a 1.50mt-tall, 40kg woman, and once in Italy, she struggled to ride with a normal 26” city bike. So we settled for returning home to Malaysia, and train by cycling around the Northern states to test how it was. But the plan and timing turned out to be both horribly wrong: after returning to Asia, assignment after assignment kept us busy for the best part of summer and fall 2017. We ended the year drained, with a couple guidebook research trips under our belts, a workshop at the George Town Literary Festival, and a 60 days Indonesian visa for a pending departure just a few days ahead. But despite the lack of time and busy schedule, we hadn’t forgotten: we had to cycle, damn it. “Ok, settled: we are bringing bikes to Indonesia. And since we are going to fly, use boats and all, we are getting folding bikes”. Since we had to compromise anyway, folding bikes seemed the best option —as other expert cyclists seemed to suggest. Boats, ferries, and dinghies… very glad we could fold those bikes into two most of the time. The point above is pretty true, at least in a country like Indonesia, where boat transport is so common — especially in the far East where we were headed. 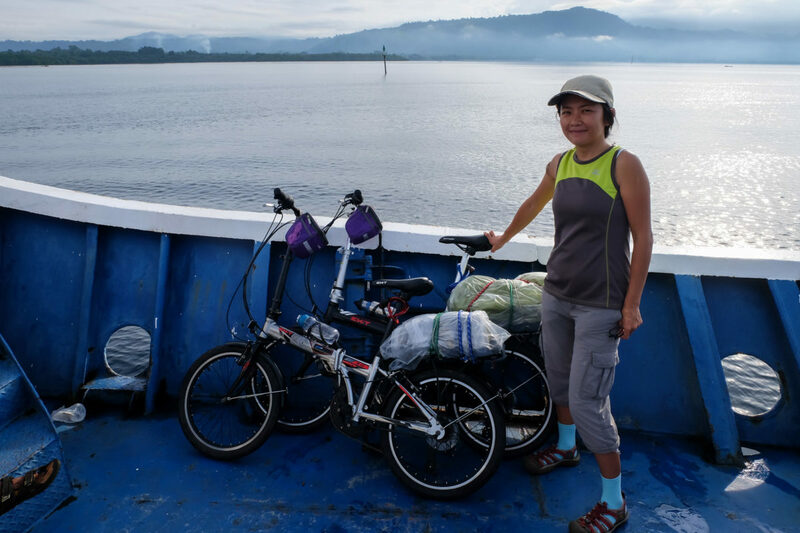 In our specific case, before cycling, we needed to catch a Pelni ferry to Sorong in West Papua in order to join a luxury liveaboard cruise we were writing about. It would take us back to the Moluccas. Folding bicycles were the best solution: our motto wasn’t “we must cycle every inch of the way”, but more like, “let’s cycle as part of an extended overland trip by ground and sea, and enjoy ourselves without stress”. We also thought it would have been perfect to always have our own wheels available to get around a new city. Folding bicycles turned out to be great for all of the above: our Exitway March and Nevada models have 20” wheels, big enough to ride comfortably, but also small enough to fit into most trunks and pass an airport check-in as oversize luggage without any issues. We packed them in soft bags and padded them with cardboard, and checked them in without a problem as normal pieces of luggage on an AirAsia flight from Kuala Lumpur to Makassar. The cost was the usual 70RM (about USD15) for a 20kg allowance. 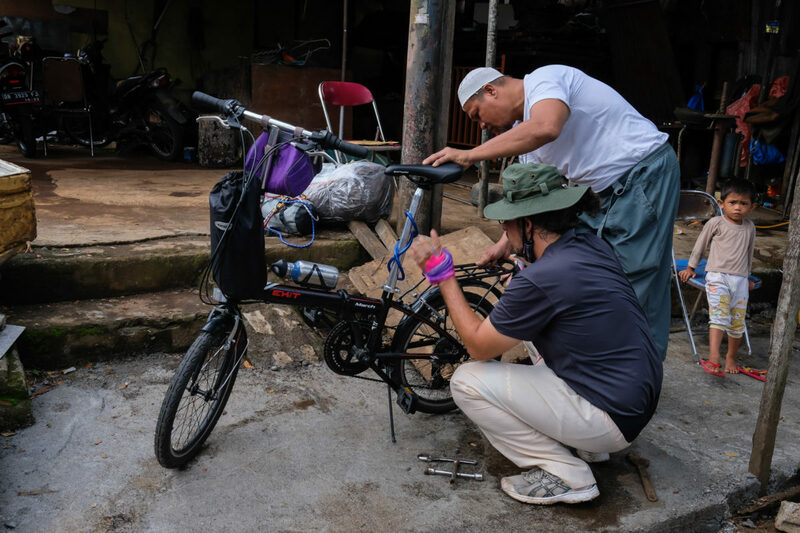 And since these bikes can fold in less than 10 seconds, they did not just impress dozens of Indonesian people — most of whom had never seen a folding bike before — but were also very quick and easy to transport on the roof of buses, car trunks, and boats. Last but not least, they were easy to stash away in people’s homes while exploring on the ground, or for safety during the night. We learned this lesson the hard way, as we did most of our cycling in central Sulawesi — possibly one of the worst places for starters. It’s a continuous series of hills that turn into mountains, even along the coastline, and suited to professional cyclists. We learned it was used just a month before our arrival for the Tour De Central Celebest. Our 20” wheels, of course, were too small for the task. We were heavy with luggage, and having only 14 gears made the whole ordeal a slow crawl: we covered the 190km between Ampana and Pendolo in about 5 days, cycling 40km on the flattest day, and 20km on the steepest. And we had to get off the saddle and push so many times we lost count. This said, with a bit of patience and resilience, we made it safe — especially when considering that all of our luggage was strapped to the back rack with chords, as we didn’t manage to find proper panniers on time for the trip. …and occasionally, even teach you how to fix a flat tire — like this kind man right outside of Manado. Our folding bikes have been conversation starters every single day we spent on the road. We have been stopped, photographed, invited for lunch, hosted and given food and drinks because of those two tiny bikes. School children have interrupted their classes to come out and cheer us, teenagers have followed us with their tiny bikes until the limits of their villages, and village headsmen have accepted us in their households because moved by the sight of those tiny wheels strapped with bags wrapped in plastic — waterproof for the real adventurer. Before deciding to buy Exitway bikes, we visited the famous bicycle scrap yard near the North-South Highway’s Jitra toll in Seberang Perai. Parked among hundreds of used Japanese bikes there were also a few foldies. Old ones: cheap, for sure, but also very hard to fold, and with only six flimsy gears. Investing a bit more for more comfort and stability was a no-brainer. Without getting to the top of the game Tern and Brompton (not always easy to find and quite overpriced in Malaysia), most folding bicycles available on the market today have little, besides the smaller size, to envy to more traditional touring bikes. When folded and loaded with my backpack on the rack, my Exitway felt stable. When the steering felt a bit wobbly, the only thing I had to do was turning a little screw, and the bike would feel as strong as I needed to push up those interminable hills. And when going downhill, it felt pretty secure, too, regardless of not reaching incredible speeds. The Verdict: Can you tour on a Folding Bike? Absolutely yes, if you are ready to compromise and choose flexibility over stability. If your goal is to have an extra piece of luggage which, yes, can be a bit of a pain to carry around, but when needed transforms into a readily available form of transport… just go for it. And seriously, just GO. Looking back, I wish I had bought our own folding bikes earlier, and brought them along on our most recent trips.